Hozuki LED Candle Lantern Flickers In The Wind | OhGizmo! By Andrew Liszewski on 04/28/10 • Leave a comment! Thomas Edison first improved on the candle with the light bulb, a steady source of light that couldn’t be extinguished by accidentally coughing in its general direction. And then in 1962 a man by the name of Nick Holonyak (or in the mid-1920’s by a man named Oleg Vladimirovich Losev) improved on the light bulb with the light-emitting diode that put the energy efficiency of Edison’s design to shame. But he we are in the year 2010 and we’re back to dealing with the same issues that plagued the candle. The Hozuki LED Lantern might be energy efficient, but it features a ‘candle mode’ that will cause it to flicker in the wind, and even temporarily go out if you blow on it too hard. That’s not a feature! That’s a problem man has already solved! The lantern runs on 4xAA batteries which powers a set of 4W LED lights. On its highest, or brightest, setting you can only expect to get about 4 hours of illumination on a fresh set of batteries, but on its lowest setting that jumps to a more camping-friendly 30 hours. 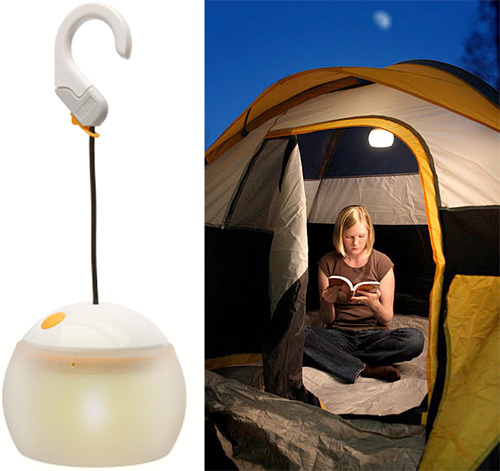 It also comes with a convenient hanging hook for use in a tent, but if used on your desk as accent lighting it can actually be powered by USB instead . $89.99 from ThinkGeek.